We ain't just moonshine and banjos! Since the late 1800's immigrants from Germany, Switzerland, and Italy have been attracted to the Ozarks for its fertile, sandy soil and moderate climate (we grow good tomatoes, too). Arkansas boasts approximately 15 wineries, and two of the most dog-friendly are right in my backyard. Photo of the patio area at Sassafras Springs Vineyard. Photo by Denise Holmes, All Rights Reserved. Tucked into 15 acres of rolling hills, this dairy-farm-turned-winery pays homage to days gone by with a converted milk barn for a tasting room and a purple cow to greet you at the entrance. 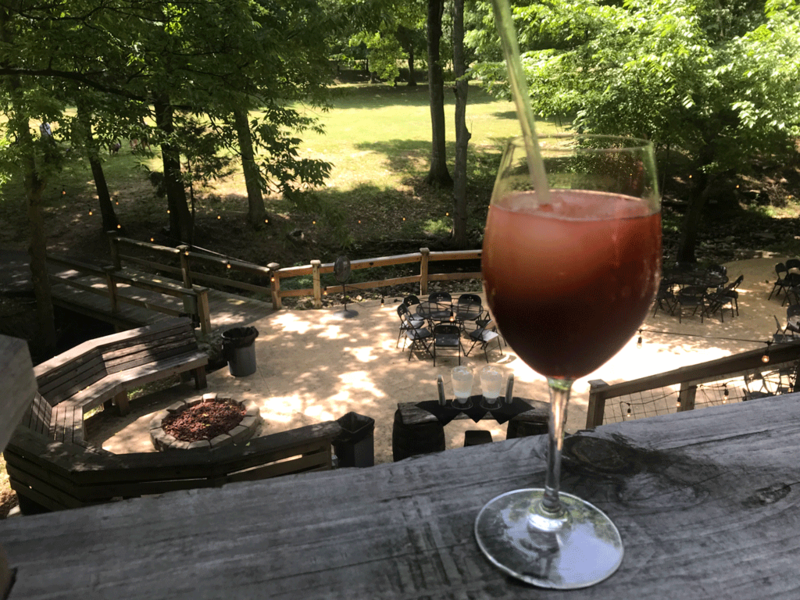 Sassafras Springs Vineyard is dog-friendly from the front door to the Chapel Ruins, and dogs are frequently seen lounging on one of the multiple shaded decks, splashing in the creek, or romping through the open fields. SSV's tasting room opened in 2014 and we've been regulars ever since. I call it my second office. It's where I go when I need to do some writing but I'm tired of looking at walls. During the day it's quiet, and Henri (my dog) and I are often the only two there. I write; He wanders. Each year this dog-friendly favorite plays host to the Humane Society's annual Dog Days of Summer event, but really, any time is a good time to visit. In 2015, they started making their own wines and the release of their first rose was just this week. The winery is open Sunday, Tuesday, and Wednesday 11:00 a.m. - 7:00 p.m.. Thursday, Friday, and Saturday 11:00 a.m. - 9:30 p.m. Dinner is available Friday and Saturday night from April - October with live music every Thursday, Friday, and Saturday from 6:00 p.m. - 9:00 p.m. inside the tasting room. You can also customize your own charcuterie board or choose one from their pre-made selections at any time. 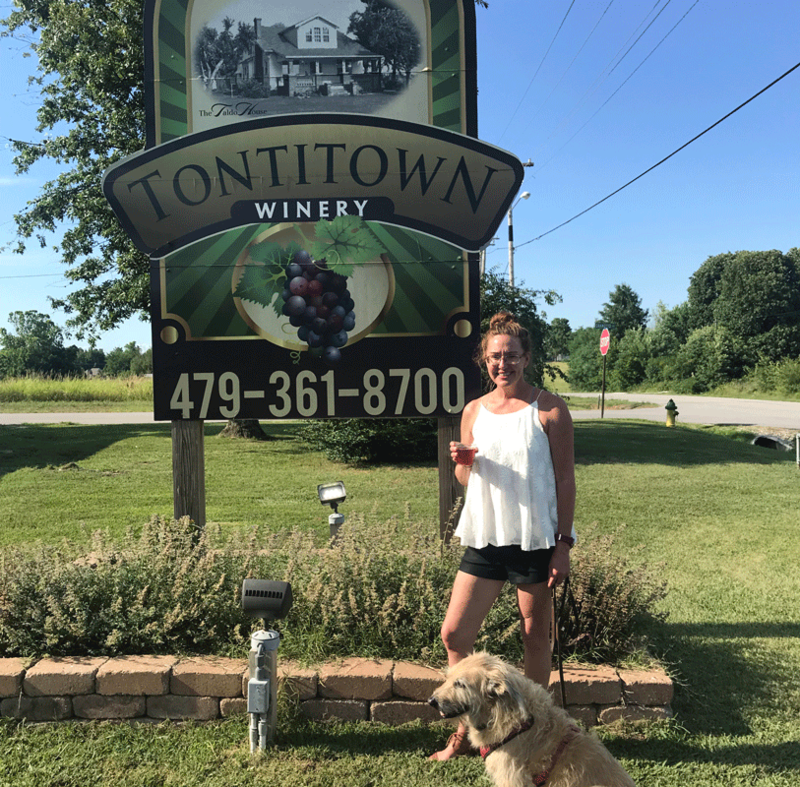 Photo of guest blogger Denise Holmes and her dog Henri at the entrance to Tontitown Winery. Photo by Denise Holmes, All Rights Reserved. In the 1400's, Henri de Tonti was the first Italian to come to Arkansas. With an iron hook for a hand, he settled in what eventually became 'Tontitown.' That same town now has a liquor store called Ironhook. I learned all this from Heather Renalli Peachee, owner of Tontitown Winery. Her great grandfather came to Tontitown from Italy in 1907 and by 1923 he had worked and saved enough money to buy the family farm. That farm is where Heather's family grows their grapes and in October 2010, they decided that this small town in Northwest Arkansas, known for its great Italian food and viticulture, was way past due for a winery. Now, Heather didn't use the word "viticulture." I threw that in myself to show off. Heather says, "We don't take wine too seriously. I can tell you how to grow grapes, but I don't know much about food and wine pairing. I say drink what you like!" Since Arkansas' warm days and cooler nights lends itself to growing Northern grapes such as Concord and Niagra, and since I'd had neither, after chatting with Heather, Henri and I went to the dog-friendly tasting room to give them a try. The Concord is described as "Sweet, fruity. Medium bodied and fresh." I have a feeling Heather wouldn't describe it that way, so I won't either. I will tell you that it would make a damn good sangria and I've already got a recipe rolling around in my head. The Niagra, a Tontitown classic, is described as "Sweet, luscious with flavors of tropical fruit." It was definitely sweet but I thought it had slight grassy smell. I liked it! I also liked their wine-a-ritas, the local food truck that was making crepes, and the band. The "winery" property is really just their public hangin' out space; the farm down the road is where the grapes are grown. They purchased the additional land in 2010 because of its central location, historical relevance, and proximity to the Catholic church. Open 7 days a week for free wine tastings, the property includes a banquet room (the only place dogs aren't allowed), a tasting room and gift shop, a front porch and back deck. 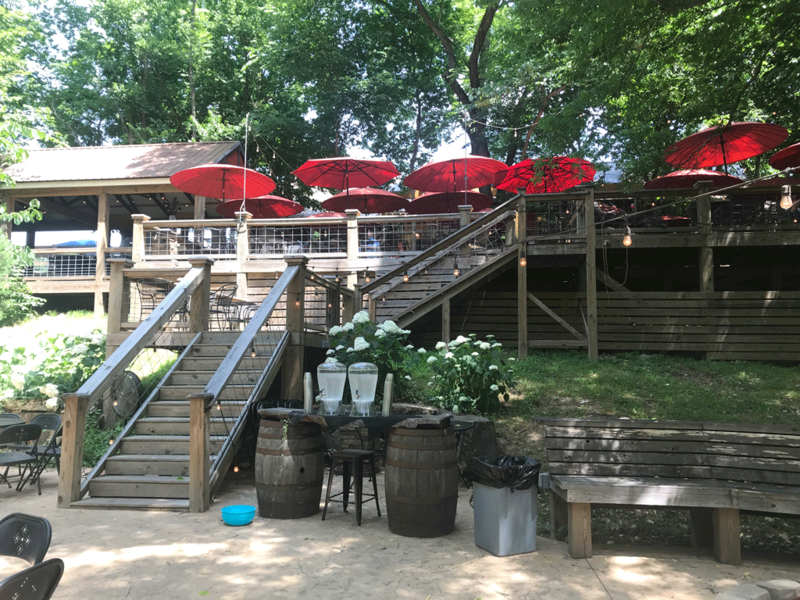 It's the perfect spot to share the family's history with locals, and on sultry Arkansas evenings, the deck is crowded and the plastic chairs staged in the parking lot catch overflow. Seating is first come-first served, except for the one 6-top with the jacket on it. That table belongs to 'Nonno,' Heather's father, if he decides to come. Join the family and their friends on Friday and Saturday nights from May - October for the Sip & Sing featuring live music, local beer and wine, and rotating food trucks from 7-10 p.m. The casual setting of Tontitown Winery will remind you not to take wine to seriously and "Drink what you like!" The Fayetteville downtown square features an award-winning farmer's market open Tuesday, Thursday, and Saturdays. Saturdays are the best time to visit this exceptional market and explore the many dog-friendly shops and restaurant patios. Crystal Bridges Museum of American Art in Bentonville "welcomes all to celebrate the American spirit in a setting that unites the power of art with the beauty of nature." The outdoor space features 3.5 miles of trails, several of which are dog-friendly. Enjoy the beauty of the Ozarks in this very unique setting. The Buffalo National River is our nation's first designated National River. Make a day out of paddling this pristine setting and pack a lunch to enjoy on the many river banks you can find a long the way. Contact a local outfitter for lodging or rental information. 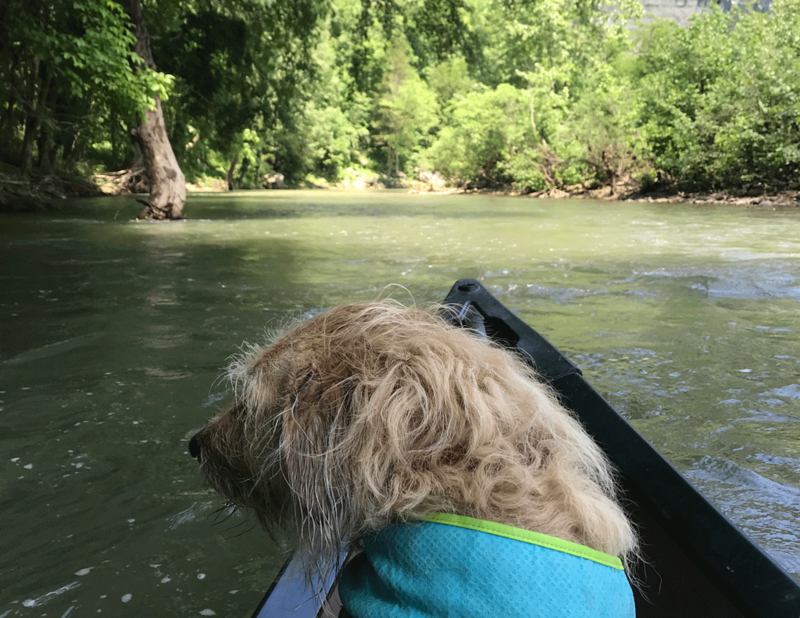 Photo guest blogger Denise Holmes's dog Henri enjoying a boat ride along the Buffalo River. Photo by Denise Holmes, All Rights Reserved. Chateau Aux Arc located in Altus, Arkansas is female-owned and home to Arkansas' first ever Chardonnay vinyard planted in 1982. Cover Photo by Denise Holmes. All Rights Reserved. 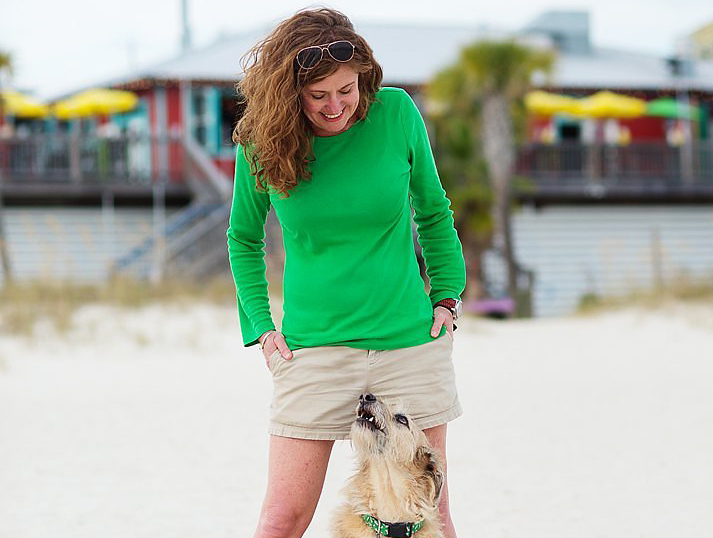 Denise is a professional pet trainer and pet travel blogger. When not working with clients in Northwest Arkansas, she's looking for any excuse she can find to hit the road with her dog, Henri.